The number of international migrants is expected to surpass 250 million this year, an all-time high, as people search for economic opportunity. And, fast growing developing countries have increasingly become a strong magnet for people from other parts of the developing world. 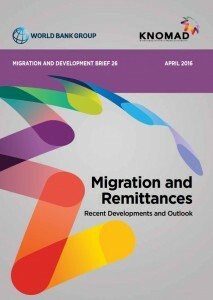 In a demonstration of their economic footprint, international migrants will send $601 billion to their families in their home countries this year, with developing countries receiving $441 billion, says the Migration and Remittances Factbook 2016, produced by the World Bank Group’s Global Knowledge Partnership on Migration and Development (KNOMAD) initiative.